Preheat oven to 500°F. Place a rimmed baking sheet in oven (leave pan in oven while it preheats). 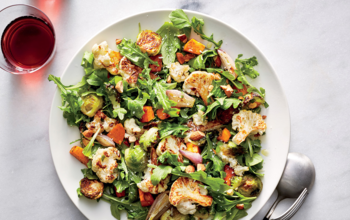 Combine sweet potato, 1 tablespoon oil, rind, 3/16 teaspoon salt, pepper, Brussels sprouts, 1 tablespoon Parmesan cheese, shallots, and cauliflower in a bowl. Spread potato mixture on preheated pan; bake at 500°F for 15 minutes or until golden brown. Combine remaining 1 tablespoon oil, remaining 1/8 teaspoon salt, tarragon, and vinegar in a large bowl. Add arugula; toss to coat. Divide arugula mixture among 2 plates. Top evenly with vegetable mixture, remaining 1 tablespoon Parmesan cheese, and almonds. Don’t be scared of a hot oven—roasting the veggies at 500°F gets the job done quickly and gives the vegetables a nice golden color. Tarragon has an anise flavor similar to fennel; you can omit it or substitute sliced green onions or parsley for a fresh pop.